A great night’s rest is a cornerstone of a happy life. With an inflatable air bed, you and your loved ones can sleep comfortably just about anywhere. Easy and quick to setup, an air bed is perfect for temporary guests or any other impromptu sleeping needs. Durable and lightweight, they’re also available in small and compact packages making them the best camping mattress for practically any outdoor adventure. I don’t know about you, but when I was 10 years younger even the best air mattresses on sale were pretty flimsy and uncomfortable. They were more like an inflatable pool raft which had to be blown up manually. They certainly weren’t ideal for a great night’s sleep. Today, technology has advanced substantially. You can find plenty of inflatable air beds which are just as comfortable as the traditional mattresses in your house. Plus, setup is super easy. However, while they are better than ever before, individual features can vary considerably between models. If you’re looking for the best air bed for your needs you’re in luck, because I spent 30 days testing out a wide variety of brands and models for both indoor and outdoor usage. It was a tough job, but somebody’s got to do it! My complete guide to blow up / inflatable air beds is below, including my top five favourite picks. Sweet dreams await! What Is An Air Bed / Mattress? Air beds are a temporary, inflatable bed which is designed mostly for occasional use. They’re usually made from PVC. While traditional beds are filled with memory foam, latex or springs, air beds are filled with nothing but air. Air beds are portable and can be deflated for easy storage. They’re also adjustable. You can inflate or deflate to provide the perfect level of comfort. Many people with chronic back issues find that a blow up bed provides great night time relief. What type of features will work best for your needs? Some air mattresses have no frills at all. These are usually a bit cheaper. However, most people prefer at least a few simple features. Built-in, inflatable pillows are an easy way to add extra comfort to your rest. They’re great for camping because you don’t have to bring along extra pillows. Another popular feature is raised bumpers. This is an inflated ring around the perimeter of the surface which prevents the occupant from falling out. Raised bumpers are often a good choice if it will primarily be used by small children. But these pointers are just a tip of the iceberg. Lets take a more in-depth look at how to choose the best inflatable bed and some of the key features to look out for. Thickness varies, but most blow up beds are either single or double height. Single-height types (low profile) are generally between 7 and 13 inches tall. Double-height mattresses (raised) are usually between 18 and 22 inches high. Double-height mattresses are easier to get in and out of than the single-height. The taller beds are a better choice for older adults or adults who will use for an extended period of time. The single-height mattress is preferred for anyone who wants to save space. Smaller air mattresses for kids are available too, which are usually single height. ​Low profile blow up beds have no base at the bottom. This makes them slightly smaller and more compact. Most camping mattresses are thin so they can be easily stored in a backpack when deflated and rolled up. At the same time, you do sacrifice some comfort. A thinner bed isn’t ideal for extended house guests. Instead, they’re typically considered a step up from a folding floor mattress. Raised types are the thicker and more common type of air mattress. They’re typically about the same height of a normal bed. Raised air beds have their own inflatable platform. A raised mattress is easier to get in and out of. They’re generally a better, more comfortable option for house guests. If you’re looking for a less portable and more permanent blow up bed, you’ll want a raised air mattress. The main disadvantage of a raised mattress is size. You probably won’t be able to keep the deflated raised mattress in a backpack or other small space. Raised mattresses are better stored at home. Air Mattress Pump Types: Internal Or External? Blow up beds are inflated with either internal or external pumps. External pumps are separate from the mattress. These pumps can be powered by foot, battery or from an electrical outlet either in a home or car. Air mattresses with external pumps are usually the cheapest option. Another advantage is that if the pump breaks down you don’t need to buy an entirely new air mattress, simply buy a new pump, which are fairly cheap. Internal pumps are built directly into the mattress. The inflation level can easily be set with just the turn of a knob or press of a button. Powered by batteries or electricity, internal pumps inflate faster than external ones. These are the more popular type of pumps. The major downside is that repairs can be complicated if the pump breaks. You want an air mattress big enough to fit your needs. Some need to be large enough to fit two people while others need to fit two adults and kids. At the same time, you may want it to be no larger than necessary as a bed and typically stored away when not in use. Most inflatable beds are either Double or Single sized. Kings are also available although they’re harder to find. However, you’ll want to carefully check the specific dimensions of the product. These tend to be smaller than their traditional counterparts. Checking the dimensions is pretty simple when selecting an inflatable bed. But don’t forget the true size of your mattress when ordering sheets and mattress pads. For example, Double sized sheets will be too big if your bed isn’t truly Double sized (despite how it may be advertised). Some people rarely store their air mattresses. Instead, they use them basically as permanent beds. Generally, if you’ll be using an air mattress as your main at-home bed, you’ll want at least a King or a Double. A raised / double-height mattress is also probably a good idea because you’ll be getting into and out of it every day. Note that there are two major disadvantages to a permanent blow up bed. First, they aren’t really designed to be used day after day, month after month. There will likely be air leakage over time. You’ll need to refill or top-up likely every few days. Plus, a blow up bed doesn’t hold in heat very well, and nor are they very comfortable on chilly winter nights. You’ll want to help trap heat with either a mattress pad or thick sheet. 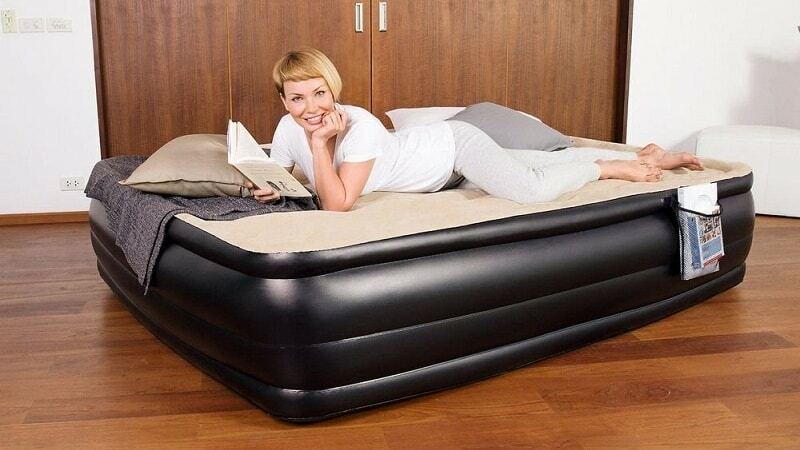 An inflatable bed is perfectly suited as a temporary solution. More comfortable than a couch or floor, they are perfect for house guests, grandkids or any other part-time visitors. The main advantage is that you can easily deflate it for easy storage when not in use. A camping mattress is usually a lot thinner and often known as a camping pad. But why not camp in style with an inflatable bed? A small single air bed can usually fit into a backpack when rolled neatly. When you arrive at your destination, you can inflate with a battery, manual pump or with your car’s cigarette socket. Certain air beds are specifically designed to fit into the backseat of a car. They have a custom shape which fits into the rear foot-wells for a snug fit. While maybe not the most comfortable sleeping position in the world, they can make do in a pinch. Works well for road trips and weekend getaways. There are two potential problems you’ll want to be aware of: Leakage and balance. Some air leakage is inevitable. Air beds won’t hold full inflation for an unlimited period of time. What you want to watch out for is quick deflation. The air bed should be able to stay inflated for at least 12 hours. Most air mattresses have a manual inflation tube. This lets you blow up with air without having to activate the pump. Manual inflation is usually the fastest and easiest way to give your mattress a bit of extra cushion. Avoid any air bed which deflates too much during a 24-hour period. But you don’t need to be too concerned if leakage occurs after two or three days – that’s perfectly normal. Balance is another issue to be aware of. When getting on or off an inflatable bed, air movement can cause a shift in the stability. For instance, if two people are sharing, one person can get jostled around when the other stands. This is often referred to as motion transfer in traditional mattress terms. To keep things comfortable, look for an inflatable bed with structural supports in its spec. Thick construction materials, air coils and internal I-beams all help feel more like, well, a bed instead of a swimming raft. 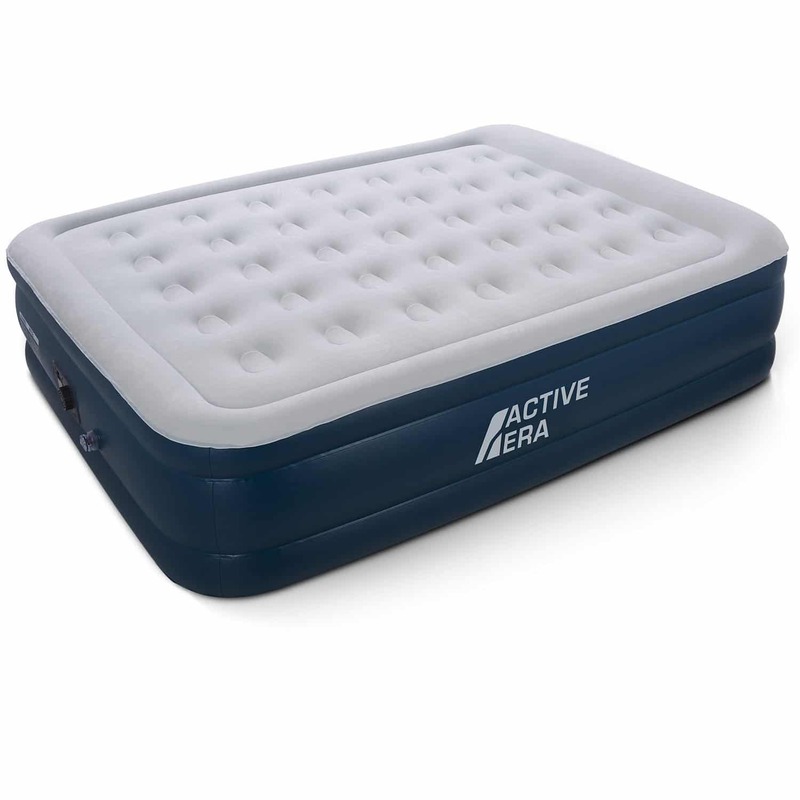 Formerly The Body Source, Active Era is a new name in air beds with a long-standing reputation for quality. 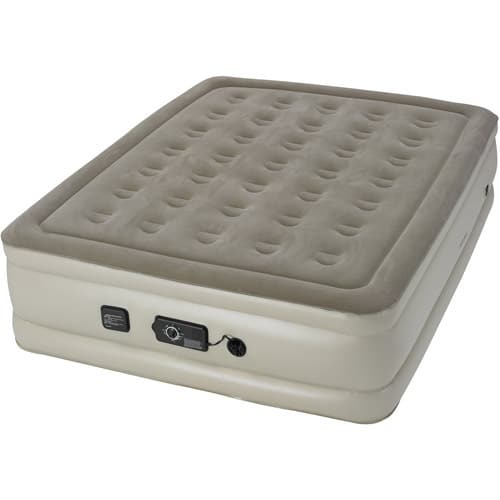 This is a very sturdy Queen size double air bed with 15-gauge puncture resistant material. Perfect for camping, extended storage, and other rugged situations. Inflation is a key feature here. The built-in electric pump fills the bed in just three minutes. There’s also a setting for quick deflation. If you can’t or don’t want to use the electric pump, a manual air valve is also available. I found this blow up bed very comfortable thanks to the built-in neck and head support. Plus, it is soft with a waterproof flock. Adding to the comfort are 35 structured air coils to help distribute weight evenly. 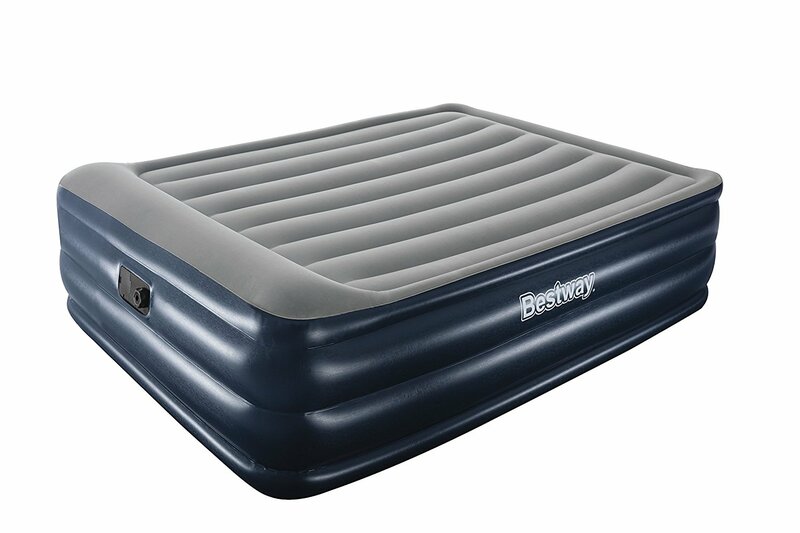 Waterproof and rugged, this is an excellent air bed for camping. Can easily handle wet and rough weather. Although this is a Queen size, it folds down small enough to fit into the back of a car with ease (although might be a bit too big for a backpack). 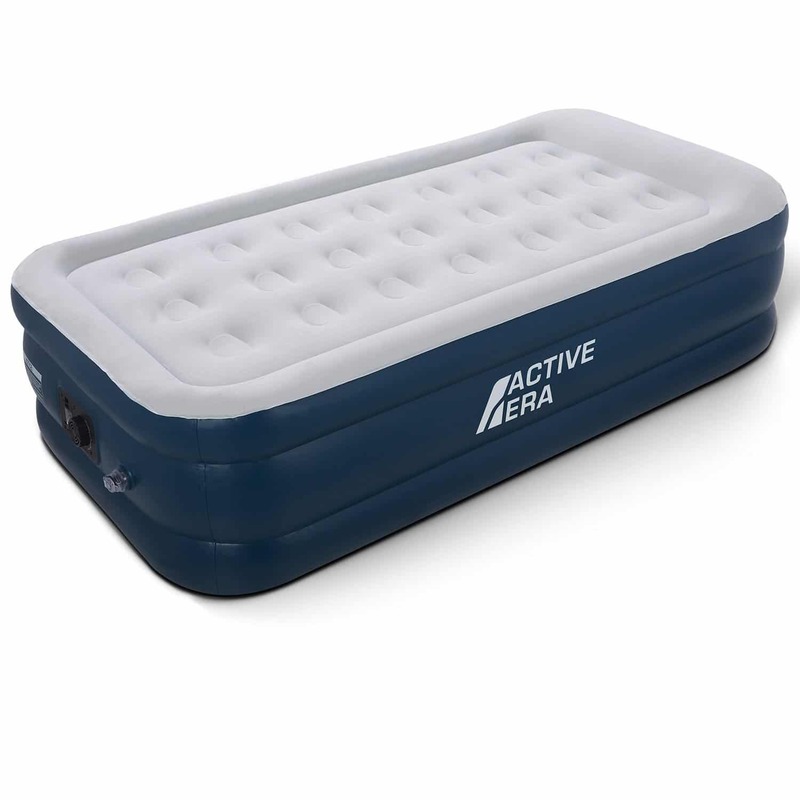 This air mattress is mostly similar in construction to Activa Era’s Queen size, but smaller and more portable. The material used is thick, rugged and waterproof. Fifteen-gauge, puncture-resistant material can withstand tough, outdoor use in practically any weather. But don’t let the ruggedness fool you. This bed is extremely comfortable with a built-in head and neck pillow plus 21 structured air coils. An integrated electric pump lets you inflate easily no matter where you are. Full inflation takes around a minute and a half. This is a single bed designed for one person. Works well for solo camping and taking to your friends house for those occasional sleepovers. The small size also makes it easy to store in preparation for when guests come over. Includes a puncture repair kit. Quick to setup and comfortable, Bestway’s Night Right air bed fits right at home anywhere in your home. The flocked sleeping surface doesn’t even require a sheet. Plus, the sturdy I-Beam construction provides plenty of back support and stability. 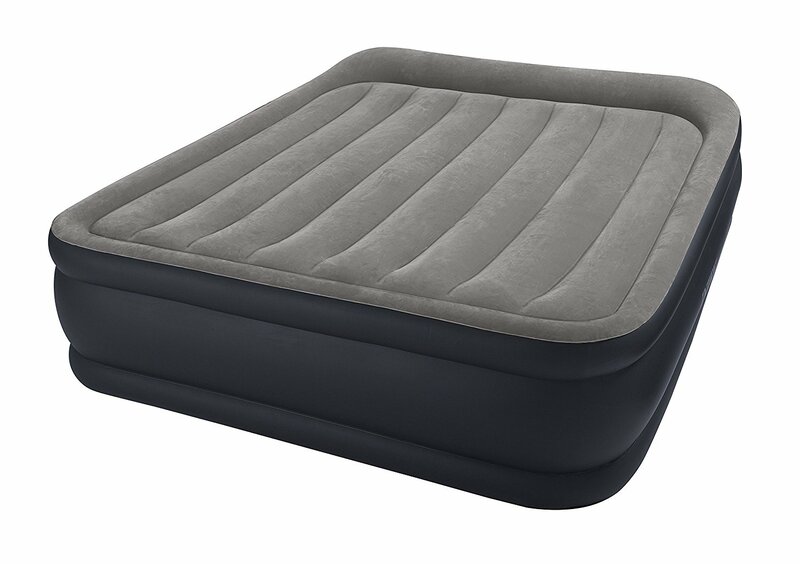 This is a Queen airbed with a ribbed design I’ve never seen in another and is probably the most comfortable on the market right now. It also inflates at lightning speed. You can pull it out of storage and have it ready to go in about 300 seconds. At the same time, this inflatable bed is designed and marketed for indoor use, making it perfect for house guests. But the materials and construction aren’t really well suited for harsh weather or extensive portability. Probably the best air bed for in-home use, but not so great otherwise. Maximum comfort with minimal effort. Whether out in the woods or simply in the spare room, Livivo’s Delux Inflatable is practically guaranteed to give you a great night’s rest anywhere. The difference here is in the details. The double-layer base provides plenty of support while the bulged outer frame keeps you safely in the bed. This is a double size air mattress which can fit into a four-man tent. Fully inflated, the size is 77” by 57” by 18.5”. 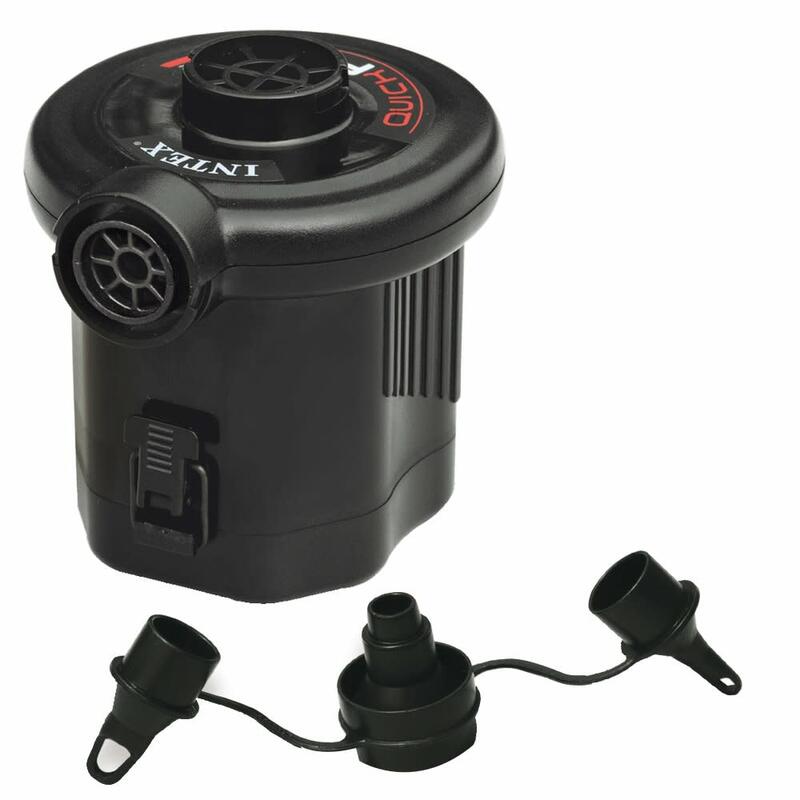 Built-in pump using 240v via a 3 pin plug allows for fast inflation and deflation. This is one of the best air mattresses around offering a large enough surface to support more than two adults. Great for when the kids want to have a sleepover or when the whole family wants to go camping. Looking for maximum comfort? Intex’s Queen Deluxe is so relaxing, your guests won’t want to leave. 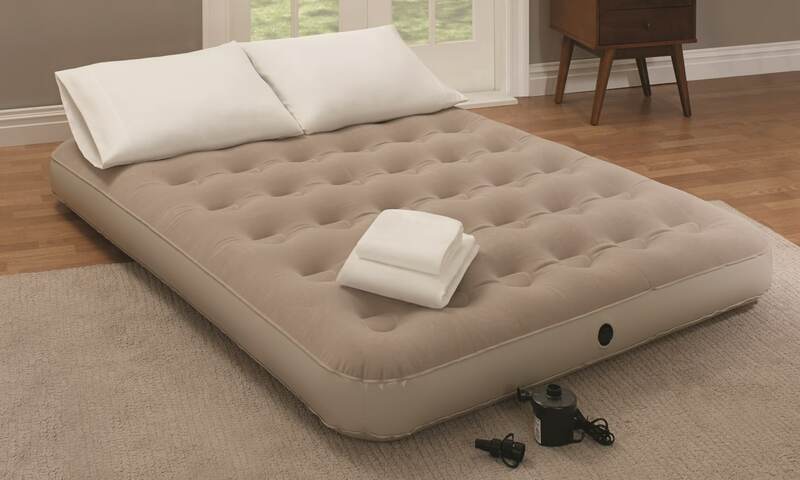 This is a double layer air mattress large enough for two adults. The Dura-Beam dividers help provide support making this a good choice for seniors or anyone with back issues. The mattress includes sturdy edges and a built-in pillow. Note that the pillow isn’t a full pillow but more like an extra edge which can help a full pillow from sliding off. The top layer is extra soft. Although the material is waterproof, this air bed is best suited for indoor use. With a contemporary blue and grey design, the Queen Deluxe looks right at home in a guest room. Unlike most air beds, this one actually fits back into the included storage bag. Once contained the entire bed is roughly the size of a rolled up comforter. Due to the built-in pump, overall it is fairly heavy even when fully deflated. All five of our air bed reviews above have great qualities. However, when it comes to finding the best air bed, for you it is really determined by your specific needs. 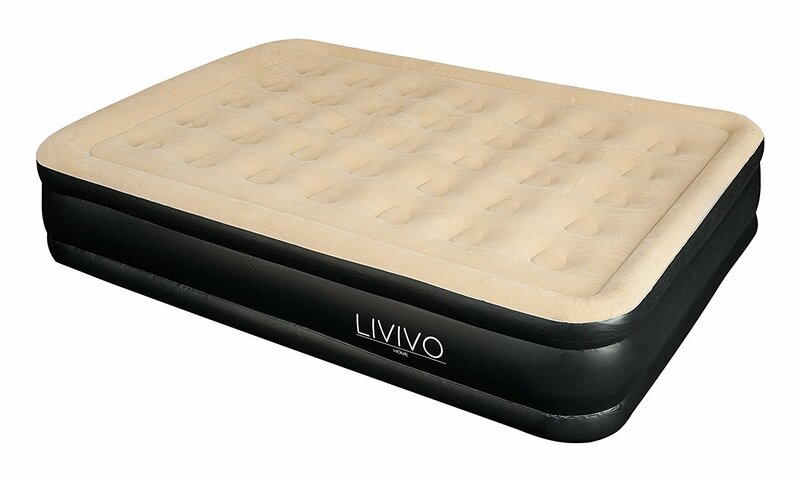 If you’re mainly interested in finding an air bed for temporary needs, both the Livivo’s Delux Raised Double Air Bed and the Bestway Night Right Raised Airbed (Queen) are excellent choices. Their combination of design and construction is ideal for guests, kids, and other temporary usages. Solo campers are going to be well-served by the Activa Era Premium Single. Lightweight, waterproof and durable, it’s a good choice of mattress for camping in practically any condition. Being a Single size (91 x 187 x 46cm) it fits comfortably into most tents. It comes with a puncture repair kit included and a raised area which serves as a pillow if required. In my opinion, the Activa Era is the best air bed for camping. But if you’re looking for an all-round winner, my personal recommendation for the best air bed is the Active Era Premium Queen Size Double. The 15-gauge puncture resistant material is perfect for camping and other outdoor activities. At the same time, the 35 air coils and neck support provide a level of comfort comparable to a traditional mattress. With a built-in pump, inflating takes just three minutes. Deflated, the bed folds down for easy storage in a closet or trunk. Whether for yourself, your family or guests, an air mattress can provide a great night’s rest just about anywhere and at a fraction of the price of a full size bed.